The duo picked up their sixth-consecutive victory at Willie O’Ree Place, a 7-6 win against Danielle Schmiemann/Jason Ginter, on Friday afternoon. Because of that win no other team was able to catch them in the standings during the evening draw. Campbell/Morris leapfrog the qualification game on Saturday afternoon and are back on the ice in the evening for the quarters. The duo finished the round robin with an 8-5 loss to Kim Tuck/Wayne Tuck for a 6-1 round-robin record. Campbell and Morris realize they’re not the youngest in the field of 32 teams, and appreciate the time to rest and recover. “Usually the majority of the sweeping is one player and even though they’re shorter games it’s a grind on the body so having an extra game off is huge,” Morris said. But the playoffs are single-elimination games, meaning there’s no room for error. But the team is growing more comfortable with each game. “The most important thing is we’re getting a bit better and comfortable with the ice and with each other. We’re moving in the right direction and that’s the most important part,” Campbell said. Morris is the type of player who never settles for less and always pushes himself to learn and improve. These are qualities that Campbell shares and it’s resulting in success on the ice. Morris, the 2018 Olympic mixed doubles gold-medallist, needed a new partner for this event since teammate Kaitlyn Lawes was out due to injury. He put a call out to former teammate Ben Hebert to learn more about Campbell, who resides in Regina. “He really pumped her tires. I knew if Benny gave me the go-ahead to curl with her, she’s a shooter,” Morris said. 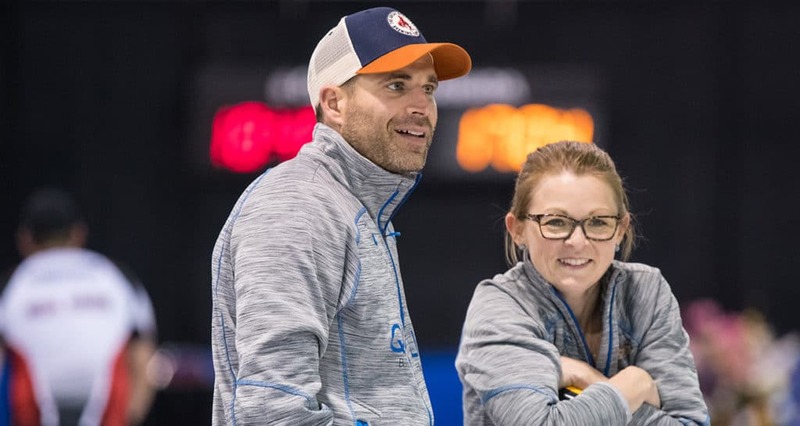 The pair played an event in Campbell’s hometown and now they are three games away from getting the chance to war the Maple Leaf for Canada at the 2019 World Mixed Doubles Championship in Stavanger, Norway from April 20-27. Campbell, a good friend of Hebert’s, wasn’t surprised with his recommendation. She knows her name doesn’t garner as much attention as her partner’s, but she’s enjoyed flying under the radar yet still being a significant contributor to the team’s flawless start. “I’m not John Morris-famous that’s for sure, but I’ve played my share of games. I’ve been around and I’ve been to my share of events so it’s not an overwhelming thing for me. I feel prepared for it,” Campbell said. She’s no stranger to representing Canada either. Campbell won the 2015 Canadian Mixed Curling Championship as third for Max Kirkpatrick and was also alternate for Amber Holland’s gold-medal team at the 2011 Scotties Tournament of Hearts. That team earned silver at the world women’s championship. 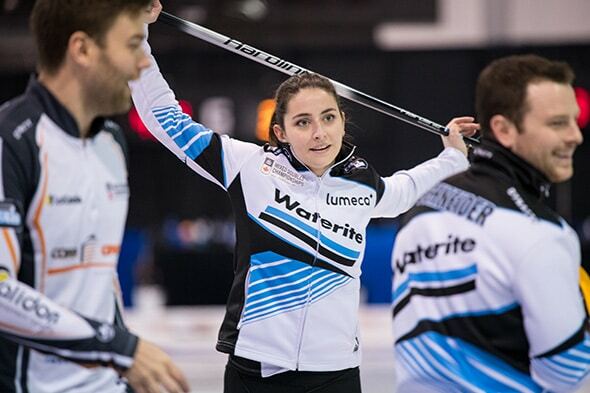 Campbell, a fantastic curler in her own right, is appreciating Morris’s leadership and will certainly value it heading into her first mixed doubles playoffs as their biggest challenge lies ahead. Dezaray Hawes and Tyler Tardi earned a spot in the quarter-finals through Pool A. Their 6-1 record was tied with Jocelyn Peterman/Brett Gallant, but they received the spot by virtue of their head-to-head record. Defending champions Laura Walker and Kirk Muyres outright won Pool B with a 6-1 record. They defeated Shannon Birchard/Catlin Schneider in their final game of the day on Friday. Nancy Martin and Tyrel Griffith won Pool C with a 6-1 record. They solidified the spot in the quarter-final after defeating Sherry Just/Dustin Kalthoff 11-6. 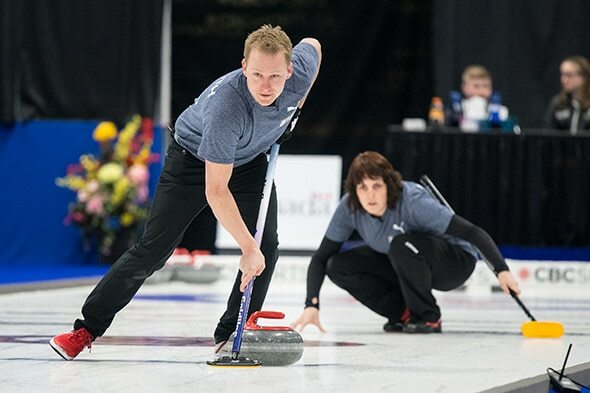 Eight more teams will play in the qualification game on Saturday at 2 p.m. Peterman/Gallant takes on Catera Park/Cody Tanaka; Kadriana Sahaidak/Colton Lott face Melissa Gordon/Kyle Kurz; Jennifer Jones/Brent Laing will play Shannon Birchard/Catlin Schneider; and Tuck/Tuck takes on Bobbi Sauder/Brendan Bottcher. Next: Everest Canadian Seniors kicks off in Chilliwack, B.C.